You are here: Home / Van Halen’s Debut Released on this Day in ’78! 41 years ago today, Van Halen dropped the Game Changer. Van Halen’s magnificent 1978 self-titled debut album simultaneously rewrote the rules of rock guitar and hard rock in general. It’s one of those rare debut albums — think The Doors, Jimi Hendrix’s Are You Experienced, Led Zeppelin— that simply announces itself. Guitarist Eddie Van Halen redefines what the electric guitar could do, developing a blindingly fast technique with a variety of self-taught two-handed tapping, hammer-ons, pull-offs, and effects. Eddie’s playing is wildly inventive and over the top, and his lightning-fast guitar leads are everywhere (especially the under two-minute instrumental explosion of “Eruption”, which revolutionized the guitar community by introducing a technique called finger-tapping into the heavy metal lexicon.) Michael Anthony’s swinging yet thunderous bass matches up perfectly with drummer Alex Van Halen’s quirky sense of time, and singer David Lee Roth, who brought the role of a metal singer to near-performance art standards, is simply on fire from the onset. “Runnin’ With the Devil” sets the tone. Roth screeches, cajoles and croons with the assurance of a veteran pitchman hawking his product to any sucker who dares to pause. He introduces Van Halen’s guitar solos with genuine anticipatory glee. Add a rambunctious cover of the Kinks’ “You Really Got Me,” the inescapably catchy chorus of “Jamie’s Cryin’,” the crash and burn dynamic of “Ain’t Talkin’ ‘Bout Love,” and the bluesy yawp of “Ice Cream Man” and there isn’t anything these four men can’t touch and turn into pure Van Halen. For that, they have made one of the all-time finest party albums. This was the only album for which the band handed complete control over to the producer, Ted Templeman. Templeman installed Van Halen at Sunset Sound Recorders, where he had steered the Doobie Brothers to a slew of gold albums. There the band labored to record a white-hot debut loaded with unabashed charisma and a powerhouse of electricity. Usually Roth sang his lead vocals live in an isolation booth at the same time the band played the music in the main studio–an uncommon practice during an era when perfectionists like ELO and Boston were creating lush studio soundscapes one meticulous tape splice at a time. 25 songs were brought into consideration during the Van Halen sessions. The band really jumped around and put on a show for themselves during the recordings. It took three weeks to record this album (Warner Bros. 3075, 1978 [35:03]) at a cost of $40,000. Production had to be rushed on Van Halen, because Eddie had mistakenly let the band Angel hear You Really Got Me at drummer Barry Brandt’s house before the album was finished. Both bands raced to put out their own cover of the song. The photos for the album sleeve that introduced the band members to the big bad world beyond Southern California were shot at the Whisky a Go Go. The guitar on the album cover was one of Eddie’s $200 specials cobbled together from a pile of cheap guitars–what he called a Frankenstrat. The front pickup was just for show, to fill the hole–only the rear, bridge pickup was actually wired for sound, because after all his hot-rodding, Eddie couldn’t figure out how to solder the switch back in place. After Van Halen’s first world tour, Eddie added red paint to the white and black guitar and also had bike reflectors attached to the back to throw lights around onstage. PROTOTYPE COVER: Shown here is a thick paper proof of the initial artwork for the debut album, featured the jagged Van Halen logo and Alex Van Halen out front. Sometime in late 1977 or early 1978, the band filmed three flashy lip-sync videos for the album at the Whisky A GoGo in West Hollywood, California, hoping to capture the dazzle of their live show so the videotape could travel places they couldn’t: “Eruption“/”You Really Got Me“, “Runnin’ with the Devil“, and “Jamie’s Cryin’. Warner Brothers paid for the sessions in an effort to decide which song to promote as the first single. The videos were planned for release as a promotional set, but for unknown reasons, the set never materialized. The band’s performance in the videos was quite humorous and provided a rare glimpse at their performance persona in its developmental stages. Smoke machines, star filters and other cheap camera and lighting techniques were used. The band’s over-exaggerated moves and slightly off lip-syncing combined with the leather and disco-shirt clothing combinations added even more amusement. In the clip for “You Really Got Me,” Eddie wielded an Ibanez Destroyer he had crudely sawed some chunks out of to make a star shape, in the process ruining the guitar for actual music. A 1978 Warner Bros promo poster for the album. Now insanely rare. Wasting no time, in January 1978, Warner Bros. sent radio stations five songs from Van Halen pressed on a special red vinyl record. The standard cardboard sleeve pictured a pointy Van Halen logo that looked like a mountain range, while the flip-side label on the record featured Elmer Fudd climbing out of the famous Looney Tunes/Merrie Melodies spirals used by Warner Bros. cartoons. The album was released on 02/10/78. It spent 169 weeks on the charts, reaching #19 on the U.S. charts (03/11/78) and #34 on the U.K. charts (05/27/78). It was certified gold on 05/24/78, platinum on 10/10/78, platinum five times over on 10/22/84, platinum six times over on 02/01/89, seven times platinum on 09/29/93, platinum eight times over on 07/11/94, and ten times platinum on 08/07/96. It was certified diamond on 03/16/99. The album was remastered and rereleased in a Gold Edition on 09/29/98. It was rereleased again in remastered form on 09/19/00. 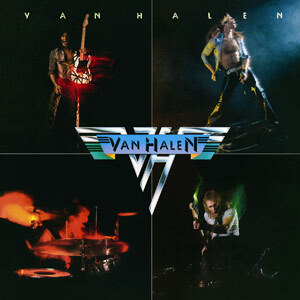 Well over 10 million copies of this album have been sold in the U.S., making it Van Halen’s bestseller, along with 1984. (As far back as 1996 it reached 10 million sales in the U.S. alone, but since it was certified Diamond in 1999 it hasn’t again been recertified by the RIAA, so the exact US sales is unknown…it could have sold millions more than 10 million by now). A limber “David Roth” as featured on the back of the album. The cassette version of this album ends with “Ice Cream Man“, while the CD and vinyl versions end with “On Fire“. Another unused shot of Dave from the album cover photoshoot. For the band’s press bio, David convinced the others to shave two years off their age in order to seem younger. As if the old guard didn’t have enough cause for jealousy, Van Halen wanted to kill them completely. There were no riots in the streets, nobody threw anything (except guitars out of windows), but it’s safe to say that from the moment people dropped the needle on Van Halen and heard what seemed to be some sort of air-raid alarm (actually, it was the band members’ car horns synced together and slowed down to ominous effect) they were in a state of shock. A new movement was taking place, and Van Halen, with a bratty authority and a rapacious sense of purpose not heard since the debut of Led Zeppelin, were leading the charge. A nearly flawless piece of pop art, Van Halen is one of those great rarities in music, at once simple and sophisticated, distilling the band’s prodigious chops and party-hearty aesthetic into hummable melodies that took hold of one’s senses and didn’t let go. “Ain’t Talkin’ ’Bout Love,” “Jamie’s Cryin,’ ” “Runnin’ with the Devil,” “I’m on Fire”— there isn’t a bum track to be found. As both singer and carnival barker of sorts, David Lee Roth made all the right noises: surprised whoops, leering come-ons, testicle-gripping screams, hollers of “whoa now” and the like—the full panoply of orchestrated letme- entertain-you shtick. Alex Van Halen and Michael Anthony more than held up their respective ends, providing a prizefighter’s punch and, in the case of Anthony, background vocals that sailed in the air and served as the perfect counterpoint to Roth’s gruff voice. Of course, there was Eddie. Of all the young guitarists who ever issued a debut record, he’s the one who delivered on promises he never had to make. Dispensing with the usual wobbly preamble of a flawed but ambitious first record, he burst through the gate as a musician who valued substance and emotional contact over mere technical flash. With poetry in his heart and a panoramic vision of where he was headed, he never had to develop into something special, for he was already there. Being thrust into the pantheon of greats at such a tender age (he was 22 at the time) and so early in his career can be ruinous to most musicians, but Eddie’s extraordinary energy and thirst for innovation proved to be invaluable strengths. Guitarists the world over saw the rashness and speed of his gifts and emulated him in a way that no musician has ever had to endure. “Eruption” was and continues to be a litmus test for budding axslingers—what Frank Zappa’s “The Black Page” is to drummers, so, too, Eddie’s tour de force is to guitarists. But it’s also a cul-de-sac, for no matter how hard everyone tried to catch up to Eddie Van Halen, he was burning up the ground as fast as he could run. Over thirty years on, it continues unabated. 1978 Billboard ad announcing Van Halen went platinum. Rolling Stone magazine recently asked their readers to vote on their favorite hard rock/metal albums of the ’70s, and Van Halen’s debut album came in at number 5. Pictures of the band members from the inner sleeve. The first closeups the world ever saw. Credits: Much of the information on this page came from the book “Everybody Wants Some: The Van Halen Saga“, by Ian Christie, and the Van Halen Encyclopedia by CJ Chilvers. The Van Halen News Desk has recently acquired the VHE and we will be adding huge sections of the VHE to the VHND over the next few months. Commemorate VanHalen’s debut album with this comfortable charcoal shirt at VanHalenStore.com.